Bamford and Norden Women’s club at Norden Primary School, 4th September from 8pm. Milnrow Literary and Scientific Society 6th November (note, their website link is broken, however a phone number is provided on this Rochdale Online link if you require further information). 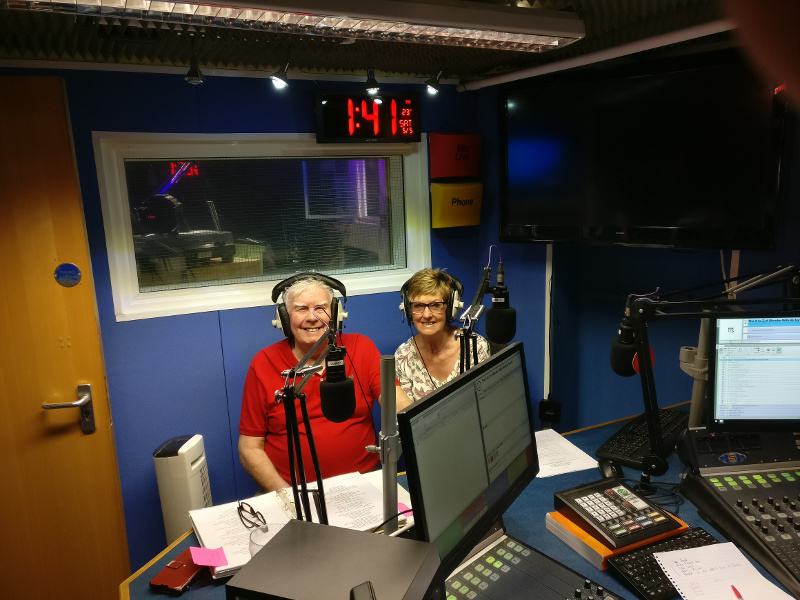 At the beginning of May, Val and Alfie recently featured on Roch Valley Radio representing the Touchstones Creative Writing group and showcasing some of their wonderful work. Val and Alfie on the microphones! If you tuned in, love to write, and want to share your work and learn new skills from professional writers then pop along to one of our monthly writing sessions. You never know, one day you could be reading over the airwaves too! On 14th August 2016 members of Touchstones Creative Writing Group performed original poetry to help celebrate the unveiling of a plaque dedicated to the community who sided with the cotton picking slaves. For black folk there was nothing but the cruellest life each day. Where they would slave in dampness and conditions that could kill. For they could understand the awful horror of their plight. To find no work was waiting and no cotton to unload. And parents didn’t know if they would ever work again. For England’s North was altered in the famine’s aftermath. Is coming back to Manchester – without the slavery. Shuttles flying forth and back. Woven from visions of young girl’s dreams. In and out of forbidding mills. Mill folk choke on thick black smoke. Relentless hum; clackety, clackety, clack. Mill’s whistle blows; engines hoot right back. All shunted on the trains strong back. as hardship and grievance across oceans interweave. the ground stilled when the looms stopped. Bales began stockpiling, men and industry together dying. pursuing solidarity in a parallel world. trying to appease their hunger on the Cotton Famine Road. while war against slavery raged. was the pittance both sides were paid. Gangs without a chain; slaves in all but name. Alabama blues made front page news. on the former Catley Lane. For clothes to keep them dry. that men should all be free. Rooley Moor’s peat bog beds. one of England’s highest, they said. 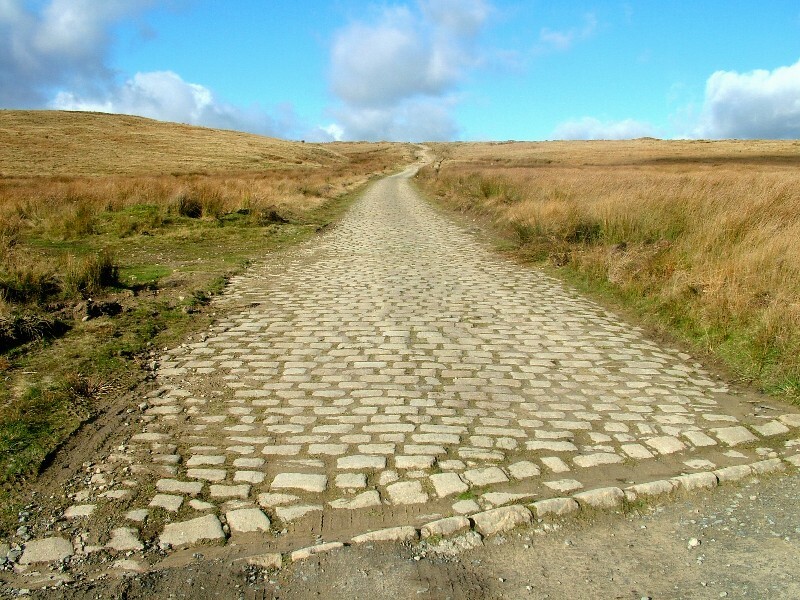 slashing the moor with its ancient tread. Before it was laid, life was good for its makers. Plentiful work in warm mills, using skill. Able to pay any household bill. ricocheted here to our nation. and stoppage brought with it starvation. Work offered in lieu for a pittance each day. Slave labour akin to black vassals. Showed guts in spite of all hassles. living on oats and their will to survive. Their story deserves to be told. bringing them down in deep poverty. and the men behind its invention. like a knocker-up tapping on glass. reflecting in mill windows and puddles. mee-maws hollowing into the night. Lowering clouds rest heavy on high peaks. And here my restless presence haunts the way. Lay down to rest and never rose again. As spirits of the dead still build the road. To earn relief for loved ones long since passed. And they no choice but do as they are bid. And a quietness hung in the air. Few carts rattled by in these times of cheerless need. And loads of twist and cloth pervade the cobbled streets. Of finer stuff than the common staple. Full of life, full of glee. Floated along in the calm, still air. When they had no clothes to wear? And downcast eye, she sang as she hugged her little one. And their love of freedom’s truth. Joined towards the Charter of the Englishman’s liberty. She had every heart strung to sympathy. Burst into a flood of passionate tears. They were always sufficiently worthy of themselves. He himself giving her a sixpence for her song. Pulling Threads, Touchstones Creative Writing Group’s performance arm, are being busy bees this summer; they’re preparing for a piece of original writing. Here are notes from the meeting and the performance dates. Reflecting on the pity of war: draft script, replica pistol & cloth to clean it. To commemorate one of the “greatest of the four battles of Ypres”, Pulling Threads are pulling together a piece of original drama based on testimonials from the battle. Annette Martens is the artistic director for this production which features dramatic true stories, horrific images, and sound. The italicised phrases are from some of the writers. 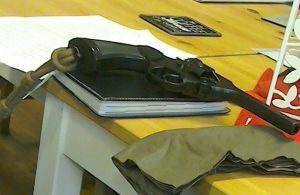 The voluntary group of players have all contributed pieces to this performance in order to capture the human element; it’s not just the facts, the sheer number of the dead or the time and slog of the battle it’s about getting to the heart of it. The facts are woven in and there is compromise and cooperation in editing the pieces. There is pathos, and sympathy, created for the characters – the nurse, the stretcher bearer, the man who had his face half blown off but lived. And there is so much mud, a mud world, who thought you could drown in the battlefield?”. The emotion and empathy that has been created shows that “bravery can take many forms”. For a small piece of land many gave their lives, and as the performance comes together the script is becoming stronger. Any audience will be moved. Next meeting: Thursday 27th July 3pm, the Heritage Cafe in Falinge Park.